This topic is only important for users who are migrating from older version of 20-sim and want to use previously constructed 3D Mechanics models. 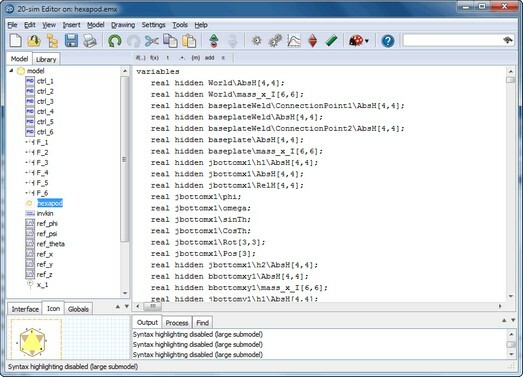 Since 20-sim 4.1, the 3D Mechanics Editor operates on masked models. I.e. you can open the 3D Mechanics Editor by selecting a 3D Mechanics model and clicking the Go Down command. If you import a 20-sim 4.0 model, you will notice that this option does not work. We will explain the actions you have to perform to do make this trick work on older models. 1. Open the 20-sim model that contains a submodel that was generated by the 3D Mechanics Editor (make sure you have stored an emergency copy). The star shaped model was created using the 3D Mechanics Editor of 20-sim 4.0. 2. Select the model that was generated by the 3D Mechanics Editor and select Go Down. 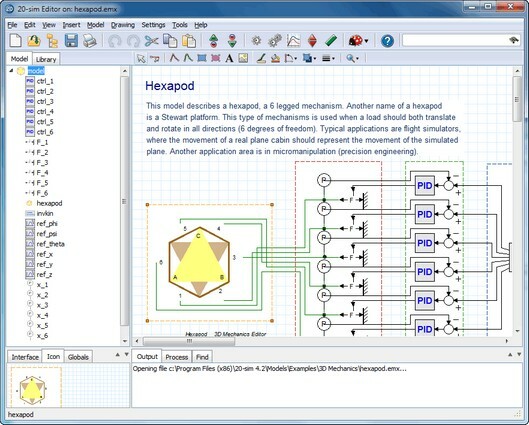 The automatically generated equations of a 3D Mechanical Model. The first line tells 20-sim which editor should be opened. 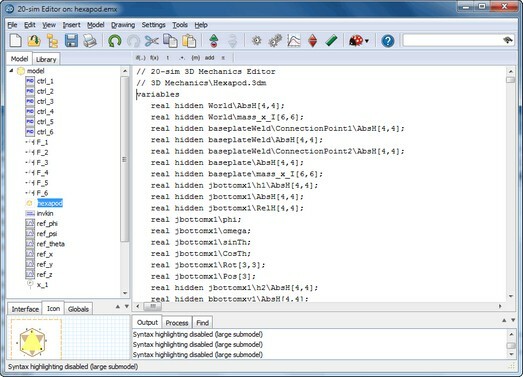 The second line shows the location of the corresponding 3D Mechanics configuration file. Enter the path and name of your own file here. The comment at the top tells 20-sim which editor should be opened and the corresponding configuration file. The next time you select the model and select Go Down the 3D Mechanics Editor will be opened with the proper 3D Mechanics model.